Find here your diet phase 1 recipes to download. This is all you will need during the hCG sublingual diet. When you receive the diet cook book for phase 1 you are provided with a list of allowed foods that you can eat for lunch and dinner. The diet phase 1 breakfast it is relatively easy. Just water, tea or coffee without sugar. You will find this HCG book great. Includes a variety of foods that you can use while one the hCG diet program. Such as different meats like chicken, shrimp, white fish, top sirloin steak, etc. A light version of free hCG diet recipies is provided on the website hcgweightlossdiets.com to download. You may want to download the free diet phase 1 recipes book here. 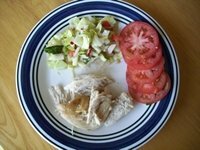 This light version includes chicken breast hCG recipes and hCG fish phase 1 recipes. With the meats you are allowed to mix with vegetables such as spinach, green salad, tomatoes, celery, cucumbers, peppers (all varieties), broccoli, zucchini, etc. This phase one recipes of the hCG diet program also includes some fruits options such as berry or mixed berries, fresh pineapple, grapefruit, cantaloupe etc. which you may eat on measured amounts 2 times per day. While on diet phase 1 recipes the fruits are suggested to be eaten between meals instead of with lunch or dinner. See below a chicken with vegetable mix and turkey with vegetable mix. Precise calories count, 250 calories per plate. Meaning, within diet phase 1 recipes you can do both in one day and still are between the 500 very low calories diet for the day. If you are using the oral hCG sublingual treatment, you can mix your vegetables to make your eating a sensational experience. But the calories count! Try our modified Dr. Simeons phase 1 protocol hCG diet system and you will experience a different style of 1 to 3 pounds per day gradual weight loss without suffering hunger. To make your HCG 21 days diet journey much easier we provide the HCG food list inventory and hCG diet step by step guidelines you may want to get it now! What About Eating Out During hCG Diet? Eating out while on phase one recipes of the hCG diet program is not recommended but possible if you can control yourself. The hCG diet only allows certain oz. of meat and it is hard to calculate if you don't have a food scale available. For example the diet phase 1 foods of the hCG diet includes 6 oz. 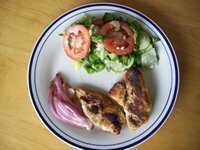 of grilled chicken, but what happen is most of restaurants offer 8 oz. of grilled chicken. In addition, once you have it in your plate, you will eat it all and will surely effects your weight loss results next day. If you order a steak, most of restaurants offer a minimum of 6 oz. and the hCG diet only allow 3½ oz. of certain type of steaks. I don't recommend to do this. While on diet phase 1 foods, dressings are not allowed in the salads and it is hard just to eat plain salads. Carrots are not allowed and most of the restaurants offer carrots, croutons and cheese as part of their salads. So, double check what is allowed to it and what is not! You are 45 seconds away from the most amazingly effective hCG weight loss opportunity to save thousands of dollars with the pain-free, easiest way to gradually loss from 1 to 3 pounds per day of weight and fat. The digital HCG diet recipes book is unique! It is perfectly designed to successfully accomplish the hCG Phase 1 of the whole HCG weight loss diet program. Please, proceed to order this digital HCG Diet Recipes Book by clicking the Add to cart button now! So, be careful when eating out specially when you are in large groups of people and they are ordering appetizers, bread and butter, drinks, etc. Alcoholic drinks are not allowed at any moment on the diet phase 1 recipes. It is vital to drink a minimum of 2 liters of allowed fluids per day and in addition 2 liters of water. You can drink as much water you would like. Maintain yourself with discipline meanwhile you are on the hCG diet program to ensure your success in achieving your dream body while keeping auto control on HCG food list as described on HCG diet protocol. To your success, concentrate in the perfect fitness condition you desire to achieve toward the end of the 21 days period of the diet phase 1 recipes.